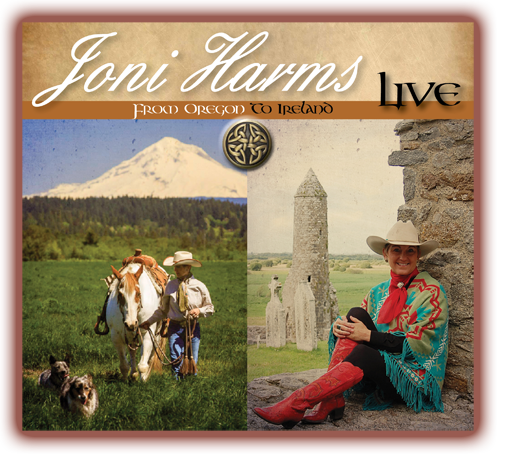 I received my copy of Joni Harms’ new CD “From Oregon To Ireland” this week and finally, today got to sit down and listen to it! Them! It’s a 2 CD set! There are 22 cuts on this set and they’re all wonderful. “From Oregon To Ireland” was recorded live in Ireland and that makes it that much more fun! The introduction in a lilting Irish brogue is great! Joni is backed up by the talented Sheerin Family Band! And the interaction with the audience makes it all that much better. You think you are sitting there with that room full of fun loving Irishmen listening to Joni Harms live!! All the songs are either written or co-written by Joni Harms and they cover a multitude of topics from the sentimental “Harms Way” to the upbeat “Let’s Put The Western Back In The Country”…From “Louisiana Hot Sauce” to “West Texas Waltz.” From “Love Won’t Get Nowhere If We Don’t Start Somewhere” to “We Work It Out.” They are all great! You’ll love it as much as I do! Order your CDs today by logging onto www.joniharms.com! You’ll be glad you did!! !